Mike Treen, General Secretary of UNITE Union. (Reprinted from The Daily Blog, originally published in 2013). Can a party that wants fundamental changes in society be a minor part of a coalition government? My conclusion is no, after having been a participant in the Alliance Party’s implosion after attempting to do so from 1999-2002 as part of the Labour-led government. But that does not mean that a minor party can’t be an effective player in parliament for reforms while continuing to build a movement outside of parliament as well for real change. Similar disasters befell radical left or Green parties in many countries. In most cases there existed a moderate centrist Labour or social democratic party that had strong support from working people but was committed to the existing system including the system of worldwide alliances with the US-led western imperial ambitions. Pressure always comes on the smaller more radical party to oppose the more right wing parties and support the “lesser evil” of social democracy. Many working people who either have illusions that their traditional party will make real change, or simply accept – albeit unenthusiastically – the reality of lesser evilism, will also often want their party to ally with parties to their left rather than their right in the hope of more progressive policies emerging. It is always worth remembering that not all Labour governments are a lesser evil. It would be hard to argue that was true for the 1984-90 Labour government. This was true in 1999 in New Zealand. There was genuine enthusiasm when Helen Clark extended the olive branch to the Alliance Party at its conference that year and what was effectively an alternative coalition in waiting won the election. 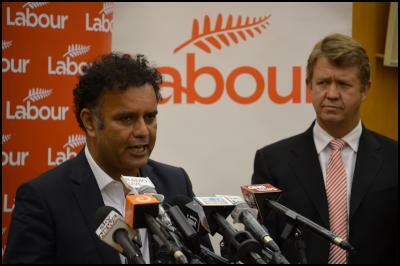 Alliance leader Jim Anderton was made deputy prime minister and three others got cabinet posts, but the party essentially disappeared from view into Labour’s embraces and its policies were seen as essentially the same. The government remained reasonably popular but the Alliance Party’s support collapsed in the polls. Technically the party retained the right to differentiate its own position from that of the larger partner while remaining in cabinet but this was rarely invoked. Then when the decision was made to send troops to Afghanistan it provoked a bitter internal fight, with the vast majority of the party rejecting the decision by Anderton and a majority of Alliance MP’s to support the government’s position. The Alliance was eliminated from parliament at the 2002 election and Anderton’s faction has simply been absorbed into the Labour Party. The problem for a genuinely radical party is that it only has minority support and cannot impose any significant policy change on a party committed to the existing system. So long as that system is based on serving the 1%, only small and relatively minor progressive changes are achievable. That was the case for the Alliance, which achieved the establishment of Kiwibank and Paid Parental Leave and some labour law reforms, despite significant opposition from elements in the Labour Party at the time. But these changes weren’t enough to significantly change the position of working people in the country. They weren’t enough to give people hope that unemployment could be eliminated, inequality radically reduced, democratic control exerted over the key sectors of the economy. If the Alliance had remained outside of cabinet it could probably have negotiated for all the changes it actually achieved, but remained free to agitate and mobilise people in the streets for the more radical changes that are needed to make a real improvement to the lives of working people. The Greens will face a similar challenge if they can achieve a majority able to form a government with Labour after the next election. The Greens have already taken the first significant steps to becoming a “partner” in running the existing system rather than challenging it when they signed up to the ETS [Emissions Trading Scheme] as a mechanism to combat climate change. They know that the ETS, or any other market-based mechanism, cannot make any real impact in combating a threat to humanity that has arisen as a consequence of the free market system in the first place. Protecting the environment and protecting the rights and living standards of the vast majority of people in the world requires the system of capitalism to be superseded. That requires a radical social and political movement that aspires to win a majority in the country – not simply assume the role of “junior partner” to a party that remains fundamentally committed to the current system. The Mana Movement, which is in my view a system-challenging movement, may also face a similar problem if the election is close and Labour and the Greens (and NZ First?) require their vote to form a government. They too will be in a position to negotiate some reforms that benefit the people who support them, as part of a negotiated agreement to allow a Labour-led government to be formed. By doing so they will respect the fact that for now they are a minority party and the majority of the people they want to represent have voted for Labour or the Greens. That democratic choice can be respected. At the same time Mana can retain their freedom of criticism and ability to organise at the grass roots for the generally timid reforms to go further, or against any reactionary policies that such a government will inevitably end up promoting. So long as these parties in government are trying to make a system “work” they can’t escape ultimately disappointing their own supporters, because for this system to work it will continue to produce economic crisis, unemployment and environmental destruction. Movements like Mana can then provide a progressive alternative for those people rather than have that disappointment captured by the right.